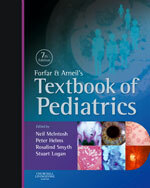 Welcome to the online support site for Forfar and Arneil's Textbook of Pediatrics 7th Edition. This title is a complete, evidence-based reference of general pediatrics written by 150 experts from all over the world. The contents cover children’s health needs and problems in the developing as well as the developed world, with an emphasis on prevention as well as treatment. It is the ideal international reference source for pediatricians and family doctors throughout the world.